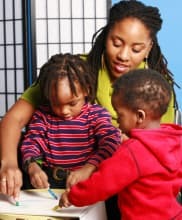 At Talk and Play LLC, we teach children to communicate and connect. With the right guidance and tools, children can break communication barriers that hinder their ability to connect with others. Want to know how children go about their day with us? Galinsky, E. (2010). Mind in the Making: The Seven Essential Life Skills Every Child Needs. New York, NY: Harper Collins. This quote has been the very soul that propels Talk and Play LLC to provide programs beneficial for children with speech and language delays or disorders. When the ability of children to communicate has been hampered by these delays or disorders, our staff will make use of our carefully designed programs to render the kind of help required to develop such ability. We look forward to hearing your and your child’s story. We invite you to take a tour and discover our services or contact (860) 235-1104 to inquire about how we can assist you. Teaching children to communicate and connect to friends, families and communities. Your inquiries will be replied to as soon as we can.